These nocturnal, arboreal snakes feed mainly on living snails, which they extract from the shell. To do so the snake follows the living snail and grabs its soft body close to the shell. As the snail retracts, it pulls the snake’s lower jaw into the shell. The tooth-bearing bones of the snake’s upper jaw simultaneously bend inward so that they can slide over the shell without breaking it. 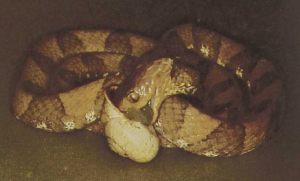 The snake then withdraws one mandible at a time, stretching the snail’s body further with each movement until the connection to the shell breaks and the soft tissues can be swallowed without the shell. There are many species of South American snail-eaters, almost all less than 3 feet in length, each specializing for a few types of snails and hunting for these in the tropical rain forests.